The BBC One series adapts Len Deighton’s ’78 novel in which German forces patrol and repress London-life in the early 40s. The London locations were filmed in boroughs including Camden, Islington, Haringey, Lambeth and Croydon. Starting on BBC One on Sunday (February 19th), the mini-series is named after the SS branch controlling Great Britain. 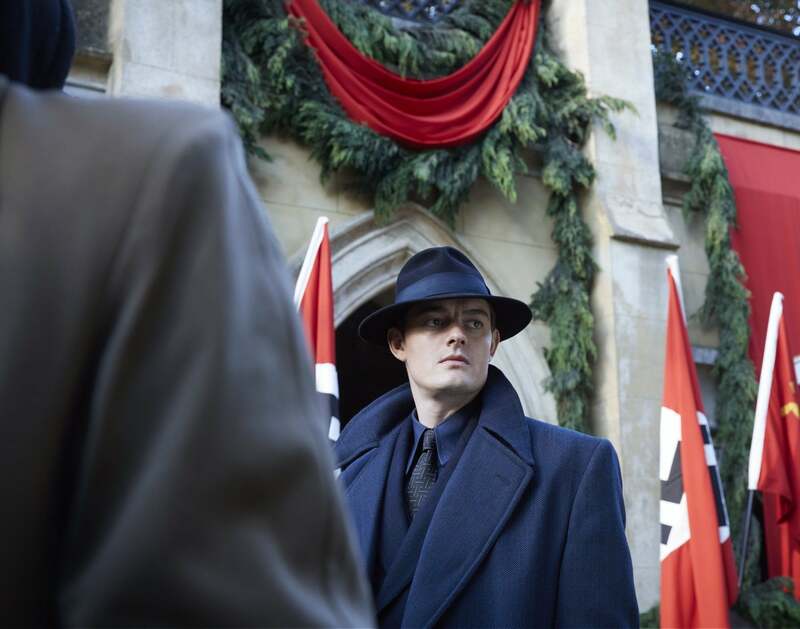 It follows London police Detective Superintendent Douglas Archer, played by Sam Riley, investigating a murder attracting the attention of the German authorities as well as the resistance. The first two episodes of the disturbing series debut at the Berlinale today. Take a look at the trailer here. Great Britain has surrendered to Germany, Churchill is rumoured to be executed in Berlin, King George is in the Tower of London and Queen Elizabeth and her daughters have fled to New Zealand. Rear Admiral Conolly has formed a British government in exile in Nova Scotia. In one of the biggest shoots for the production, across four days in October 2015, Highgate’s West Cemetery saw a huge Germany military funeral attended by high-ranking dignitaries and 100 extras dressed in Nazi uniforms. Also in the borough of Camden, we see Nazis patrolling Chancery Lane as an ambulance flies past. In November 2015 the production headed to Old Hornsey Town Hall in Haringey, for interior and exterior scenes. These include Archer arriving at Associated Pathe, with SS chief Dr Oskar Huth’s car parked outside. Also, we see Sylvia Manning played by Maeve Dermody in bed with Archer, before getting up and heading to balcony draped in the Nazi flag. FilmFixer director Karen Everett praised the production for its responsibility and sensitivity in pulling together this large and complex shoot. “Given how uncomfortable many of these scenes are to watch, it took great dedication to detail to protect Londoners throughout this shoot,” she says. “Any Nazi regalia used during filming was behind walls and screens – unseen by locals. This includes of course the footage of Maeve Dermody dressed in a Nazi flag. The production also made sure Met police were on hand to reassure the public, if need be. In October 2015, Islington’s St John Street hosted almost 100 extras in and outside the Farmiloe Building which was playing a chaotic, over-crowded detention camp. We see Archer passing an administration area where army clerks are arguing, and coming across Sylvia and Detective Sergeant Harry Woods, played by James Cosmo. Also in Islington, the House of Detention on Sans Walk became the Little Wittenham Detention Camp’s Issuing Department, where Archer interrogates James Northcote as John Spode. The Jerusalem Tavern on Britton Street plays the interior of the Two Brewers Pub, where Archer has a cup of tea and studies a map before Sylvia arrives. And where he chats with Harry Woods. The images of the Houses of Parliament were filmed across the river on Lambeth’s Albert Embankment. In Lambeth’s Windmill Walk, Harry and Archer pull to stop in their car to talk. After filming here, the production donated generously to local residents’ groups. The period streetscape of Croydon’s Hurst Way is also used to heighten the sense of time and place in the series. FilmFixer manages the film office service for London’s Camden, Haringey, Islington, Lambeth and Croydon councils.